A project to renovate Ceann na h-Airigh, Grimsay has been progressing steadily over the last four months. The work will see the former Free Church building returned to use as a comfortable and beautiful community-owned space. The work reflects the history and importance of the building to the local community, and has been done to a high standard by local contractors and tradesmen. They have created a welcoming and warm environment, providing useful and flexible spaces for meetings, socialising and events. To celebrate the reopening of Ceann na h-Airigh, Grimsay Community Association (GCA) will be holding an open day event from 11am to 4pm on Saturday, June 25th. This will be an opportunity for everyone to explore the refurbished building and to catch up with friends over a cup of tea and the usual, excellent home baking. 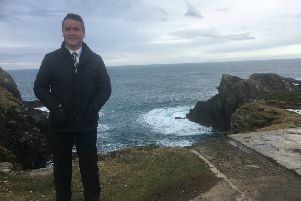 Matthew, Access and Project Officer for GCA said: “The Grimsay community has been on a long journey, from acquiring the building, raising the funds needed to achieve their vision for Ceann na h-Airigh and finally delivering it on the ground. “We’ve had a lot of fun along the way, and have missed the regular events and activities whilst this work has been going on, but we think everyone will agree it has been worthwhile when they see the new space. £50,000 of previously announced funding was confirmed from the CnES Community Capital Grant Fund, a major contribution to the renovation of the building. An award of £47,500 from the Heritage Lottery Fund ‘Our Heritage’ programme includes a contribution to the capital works to the building that will provide secure and accessible archive facilities, as well enabling a two year programme of heritage workshops and drop-in sessions, which will build upon and improve access to Grimsay’s local history and maritime collections. Stòras Uibhist granted £10,000 to GCA from the Seallach na Beinne Mòire Community Fund in recognition of the benefits that the services and activities delivered through Ceann na h-Airigh provide to all communities and visitors throughout the Uists and Benbecula, including within the South Uist Estate. The weekly local produce markets and teas will start again from Wednesday 29th June between 3 and 6pm. The markets will run to the same format as in 2015 - every Wednesday - selling only local Uist produce, plus arts and crafts, with tea, coffee and great home baking alongside. The markets are staffed, so if you are unable to attend a stall, GCA can sell your goods on your behalf. Local producers, artists and crafters who are interested in selling through the markets can contact Matthew on the details above. Plans are also well underway for the second phase of development, which will include the cafe and local food programme. GCA will soon be seeking a local person to take on the franchise to operate the cafe atCeann na h-Airigh. Expressions of Interest are now invited from anyone interested in taking on this business opportunity at the heart of the community. To receive more information contact: mtopsfield@icloud.com or GCA, Kallin Canteen, Grimsay, HS6 5HY by June 30th.